I have mixed feelings about the latest Harry Potter movie, which by the way isn’t the last one. On the one hand, it has strong visuals, a solid script, decent acting on some people’s parts, and nice cinematography at times. On the other, it’s the slowest of the Potter films, Daniel Radcliffe (Harry) and Emma Watson (Hermione) still haven’t learned how to act, and the film is unfinished. Unless you’ve been living under a rock, you know that the crew decided for some reason to release the movie in two parts. They would have the audiences believe that Harry Potter and The Deathly Hallows was simply too long a book with too much plot to adapt into a single movie, but this is clearly a falsity. On top of the obvious reason to separate gullible Potter fans from more of their money, this decision is also a lame excuse to disguise the fact that they’re poor filmmakers and lack the know-how to turn a long book into a single movie. In the hands of a skilled director, Deathly Hallows could easily have been made into one picture, albeit a long one. The novel, which is 700 something pages, does not contain too much material to fit in one movie. You don’t even get any kind of discount for the second part of the movie, which comes out July 2011 and which I like to call Harry Potter 7.65. Bottom line: Warner Bros. wants audiences to “buy one for two”, and there’s a huge problem with that. So my greatest complaint about the movie(s) was the decision to split it up and charge extra. What’s the plot? After six years attending Hogwarts School of Witchcraft and Wizardry, Harry Potter still hasn’t died. Sorry, I should have put a “mild spoiler” warning before writing that sentence. VERY mild spoiler, as the seventh book is clearly titled “Harry Potter” and The Deathly Hallows, and thus implies that somebody or something named Harry Potter exists somewhere within the pages. In this would-be final installment, The Chosen One is on the run, seeking out and trying to destroy The Horcruxes that hold pieces of You-Know-Who’s soul before confronting The Dark Lord once and for all… I shouldn’t have to summarize if you’ve read the book. Actually, if you have read the book but are the kind of person who forgets much of its contents weeks after, I suggest reading it again before coughing up your ten bucks to see the movie, because it can be deathly hard to follow at times. Steven Kloves, who wrote the script, actually does a good job of picking out only the details that help to progress the story, and eliminating any unnecessary side-plots (if such do happen to exist). The movie follows the book pretty well, except for one very awkward scene which readers will be able to detect in a heartbeat. For this reason I guess splitting the movie isn’t completely without benefit, as it does allow the crew to dwell longer on particular moments in the story, although I’m still not forgiving them, because the movie ends at about 2 hours and 20 minutes. They could easily have added another hour and a half to finish the damn thing. That would mean an almost 4 hour film, but I’d much rather watch a completed product than pay the price of two movies to see just one. LOTR: Return of the King was more than 3 hours long, and Peter Jackson’s version of King Kong almost was. There is some really good acting in the movie, particularly from Helena Bonham Carter who plays the stereotypical (or so the movie makes her) witch Bellatrix Lestrange. It’s a Severus disappointment that Snape, played by the brilliant Alan Rickman, only appears in one scene. Unfortunately, Emma Watson hasn’t become a much better actor than when she started all those years back, and neither has Daniel Radcliffe. In fact, possibly to deter viewers from reaching that same true conclusion, the filmmakers have Daniel, um, bare his chest a couple times as a distraction, first when the decoy Harry’s have to change into the real Potter’s clothes (why, might I ask? ), and again when Harry decides to take a dip in a forest pond. You may have an idea how uncomfortable I felt seeing Harry Potter in his boxers. Rupert Grint is the best of the three as Ron, but he still only amounts to “ok”. The special effects are good, but it’s a shame that the cinematographer decided to use the infamous “shaky camera” technique so much. Sometimes this produces a nice level of intensity, as in the scene where (Spoiler alert!) the heroes are attacked by The Dark Lord’s massive snake, Nagini. Other times it’s just plain annoying, particularly when they’re running from the Death Eaters and we can hardly see the action due to the shaking. And about that snake scene... parents should know that THIS IS NOT A KID’S MOVIE! It’s rated PG-13 for a reason. The MPAA noted “some sequences of intense action violence, frightening images, and brief sensuality”. That description is just about spot-on. Having read the book might diminish the intensity for some kids, but the violence, which sometimes results in blood, renders the film inappropriate for most kids under 11. The “brief sensuality” is for a hallucination the jealous Ron has of Harry and Hermione kissing passionately without any… well, kiddies will probably avert their gazes of their own accord. To conclude, the movie plays for a little more than 2 hours, but it feels much longer and is definitely the slowest Harry Potter movie. It doesn’t really offer profound examinations of complex, human characters. It’s certainly not the best Harry Potter movie yet. 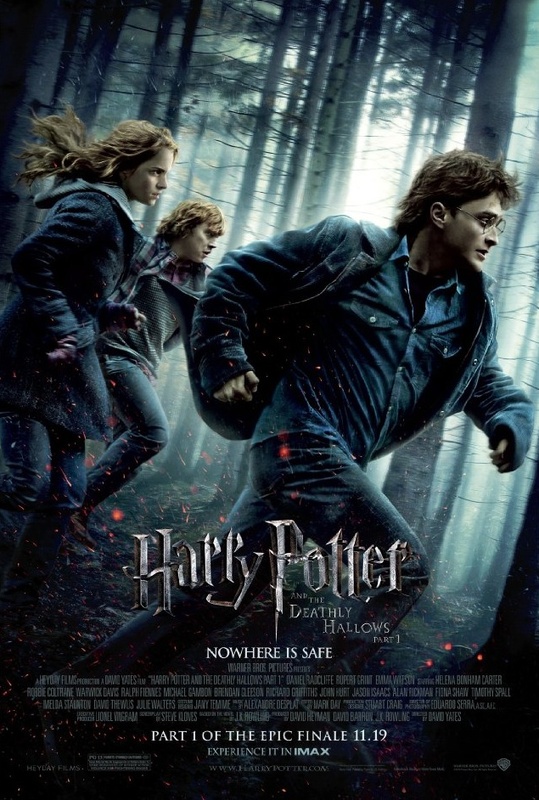 It has good parts, I think, but overall Deathly Hallows is forgettable. Wait for the dvd(s), or maybe not, if they too come separately. Grade rating: C+ or 2 stars, although I prefer to judge a movie as a whole instead of a part. Note that doesn't really fit into the rest of my review anywhere: You might know that this movie was orginially intended to be released in 3D, but time restrictions prevented that from happening. However, the made-for-3D scenes remain, especially in the beginning of the film. That part where the snake slithers across the table and opens its jaws... almost funny. See it in the trailer. Oh, and one "critic" called it "The cinematic epic that defies convention and defines a generation"... I have no idea what that means. If the movie defies the convention of a generation, how can it simultaneously define it? And here’s a bonus evaluation of the trailers I was condemned obliged to watch before the feature itself. Tron Legacy: Seems to be pretty awful all around, aside from the fact that Jeff Bridges stars. And it’s in 3D. Just what we need! The Voyage of the Dawn Treader: Looks like Prince Caspian, with a 3D touch. Skip. Kung Fu Panda 2: The first film was great and Dreamworks should have stopped there. The teaser for "Ska2oosh" was unfunny and would have looked awesomely lame in 3D. Red Riding Rood: Basically “Twilight” in a medieval period with a red cape thrown into the mix. The trailer even tells me, “From the director of Twilight”. As if that’s anything to brag about. Red is portrayed by Oscar-notminee Amanda Seyfried, who has stolen the show in such chick flicks cinematic masterpieces as “Dear John” and “Letters to Juliet”. The Green Lantern: Two movies coming out next year with “Green” in the title! What are the chances of that?! This one, which is of course based on the DC comics, actually looks like it could be some fun, at least to me. And since Ryan Reynolds is now the "Sexiest Man Alive" according to People Magazine, this superhero movie might reel in as many women audiences as men. Speaking of superhero pictures, the 3rd movie in the (Christopher Nolan) Batman series isn’t going to be in 3D. Hooray!! LOL! Love the fact that you are not only an outstanding young author, but you're a darn great movie critic too! :) Hugs & Blessings! This was a phenomenal review. I haven't read the books. My son is reading the Deathly Hollows now. I'm pretty sure I am not going to like the shaken camera effect...or the lackluster acting.